As low as $43.75 per gallon! 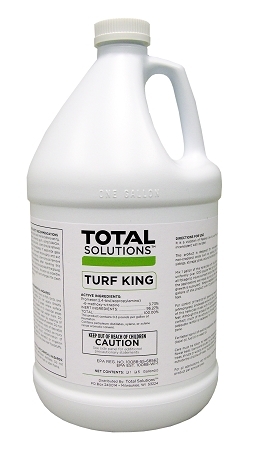 Turf King TK-10 is a fantastic non-selective ground sterilant and total vegetation killer. Turf King concentrated total kill herbicide, when properly applied according to the directions, will stay active in the root zone eliminating weeds from the root upwards to the plant. Dilute Turf King 10 to 1 with water and apply to the treatment area with plenty of rainfall to move it into the root zone. Use Turf King TK-10 in non cropland areas away from recreational and residential areas as well as outside the drip line of trees. Typical treatment areas to use a non-selective herbicide with residual control are along pipe lines, around building sides. Near Industrial sites and at railroad right of ways. Other typical places to stop the growth of vegetation are parking lots, fence rows, storage yards and tank farms. Quick and Effective elimination of all vegetation. In normal situations one application of Turf King is all you need to stop weeds from growing back for a whole growing season. Certainly the degree of duration and control depends on the amount of weed killer or herbicide applied, type of soil, rainfall or irrigation and other conditions. Strong and amazingly effective Turf King contains the powerful Prometon 3.73%. 1 Gallon of Turf King will cover around 1000 sq ft, by mixing 1 gallon with 10 gallons of water. There will come a time when you have to control hard to control weeds like pig weed, johnson grass, wild carrot, bindweed, Japanese knotweed, and other invasive species. 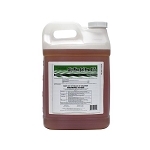 For these special applications mix 3 to 4 gallons of Turf King TK-10 with 10 gallons of water. Other invasive plants that Turf King can control are Air Potato (Dioscorea bulbifera), Autumn Olive (Elaeagnus umbellata), Beach Vitex (Vitex rotundifolia), Brazilian Peppertree (Schinus terebinthifolius), Canada Thistle (Cirsium arvense), Chinese Tallow (Triadica sebifera), Cogongrass (Imperata cylindrica), Common Buckthorn (Rhamnus cathartica), Common Teasel (Dipsacus fullonum), Dalmatian Toadflax (Linaria dalmatica), Diffuse Knapweed (Centaurea diffusa), Downy Brome (Bromus tectorum), Fig Buttercup (Ficaria verna), Garlic Mustard (Alliaria petiolata), Giant Hogweed (Heracleum mantegazzianum), Golden Bamboo (Phyllostachys aurea), Hairy Whitetop (Lepidium appelianum), Houndstongue (Cynoglossum officinale), Japanese Barberry (Berberis thunbergii), Japanese Climbing Fern (Lygodium japonicum), Japanese Honeysuckle (Lonicera japonica), Japanese Knotweed (Fallopia japonica), Japanese Spiraea (Spiraea japonica), Japanese Stilt Grass (Microstegium vimineum), Johnsongrass (Sorghum halepense), Kudzu (Pueraria montana var. lobata), Leafy Spurge (Euphorbia esula), Medusahead (Taeniatherum caput-medusae), Mile-A-Minute Weed (Persicaria perfoliata). Invasive weeds can also include: Multiflora Rose (Rosa multiflora), Musk Thistle (Carduus nutans), Old World Climbing Fern (Lygodium microphyllum), Oriental Bittersweet (Celastrus orbiculatus), Princess Tree (Paulownia tomentosa), Purple Star Thistle (Centaurea calcitrapa), Quackgrass (Elymus repens), Russian Knapweed (Rhaponticum repens), Russian Olive (Elaeagnus angustifolia) Saltcedar, (Tamarix spp.) St. Johnswort (Hypericum perforatum), Sacred Bamboo (Nandina domestica), Scotch Broom (Cytisus scoparius), Scotch Thistle (Onopordum acanthium), Spotted Knapweed (Centaurea stoebe), Tree-of-Heaven (Ailanthus altissima), Tropical Soda Apple (Solanum viarum), Whitetop (Lepidium draba), Witchweed (Striga asiatica), Yellow Star Thistle (Centaurea solstitialis), and Yellow Toadflax (Linaria vulgaris). When you want to eliminate all vegetation go with the KING. TURF KING TK-10! *NE - Any person that distributes or sells pesticides must obtain a pesticide license. *TX - A pesticide dealers license is required to sell Banish, Turf king, and Triple Threat in all sizes. A pesticides dealers license is required to sell Weed Easy in > 3 lb containers, and/or Barren in > or equal to 5 Gallons. *WA - A pesticide dealers license is required to sell Barren, turf King. A pesticides dealers license is required to sell Eliminator and Zap-It in Benton, Franklin, and Walla Walla Counties. A pesticides dealers license is required to sell Triple Threat in containers > 1 Gallon. Used this stuff for years- and I'm still happy with it. I'm just glad I can rely on these guys to always have it. Your Price: As low as $17.95 per pound! Your Price: As low as $44.75 per gallon!